Biography: Miles "Tails" Prower is a mehcanical genious, and Sonic's bestfriend. Tails was a girl in the his first appearence, but apparently changed genders when they decided to make him interested in planes. 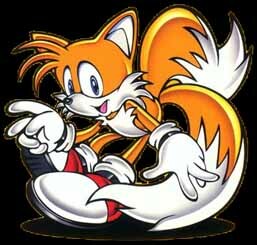 Tails has two tails and can use them like a propeller to fly like a hellocopter. Tails has fought alogn Sonic so many times, I cant ebleive they didnt put him in Sonic Underground. Tails is the true sidekick to Sonic, no matter how many other allys he gets. Tails has an IQ of 300, an exact match up to the diabalocle Dr.Eggman's, Tails also rivals Eggman's ability to build machines. In Sonic Adventure 2, Tails was armed with a three moded vehicle called the Cyclone. It had walker-mode, car-mode, and plane-mode. You mainly played as the walker. But it's a releif to see Tails back on his feet in Sonic Heroes and the advance series, that clunky walker was annoying (Except for the missles! ).